Two is always better than one. This pretty white satin garter set comes with one to throw and one to keep as a memento. The wider of the pair is elegantly gathered white satin with a sheer edge. 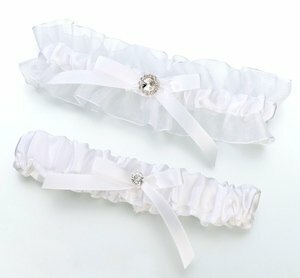 The narrower garter is simple gathered satin. Both are accented with a white satin bow and a rhinestone. One size should fit most brides.